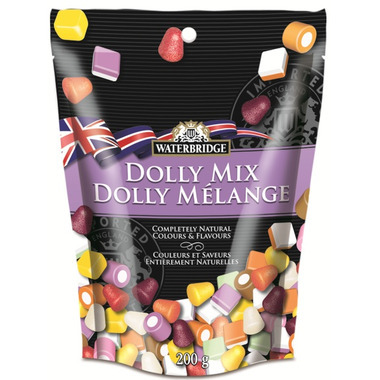 This Waterbridge Dolly Mix is a British candy mix made of multi-shaped candies and sugar coated jellies. Just like the ones from my childhood. Just need a small taste at a time so the bag lasts a while. Will buy again. It's a good thing they're tiny because Waterbridge somehow found a way to make candy even sweeter. 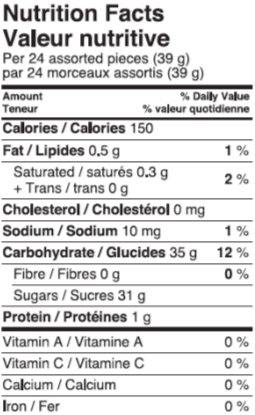 Pure sugar with some flavouring. I liked the jellies, though--I'd get just those if I could. Wow, eating these brought back so many childhood memories of being together with my late Grandmother. We both adored Dolly Mixtures! I haven't seen these available in years, I'm so happy to find them at Well. Good but VERY sweet. My kids love them as an occasional treat. Weren't as good as I had hoped. But my family loved them, so I'd order again. I liked these very much. Nice, and fresh. Good flavour, and nice varieties of flavours, too. Waterbridge always makes good candies! I like that they're small pieces, so I can have a few, and feel like I had a great treat, without eating too much sugar. Bar none, Waterbridge is the definitive Dolly Mixture experience. Every different colour of the rainbow of tiny delights has its own recognizable flavour. Not just another mouthful of sugar, a kaleidoscope of subtle taste and texture for your tongue. Not to be missed, no other brand even comes close. Addictive! This is my first time trying the Dolly Mix and it won't be the last. So fresh and delicious. YUM!! !